The dairy forecaster is a handy planning tool that helps you predict milk production (kg/MS) and related income for the year. It presents all the months in a production season in an annual view, to make entering and maintaining milk production data in your plan quick and easy. The dairy forecaster only needs to be set-up once, normally when you’re setting up your farm business in Cash Manager Focus. However, if your business model changes, i.e. if you change from sharemilking to being an owner/operator, or your share percent changes, you might need to change some of the settings. 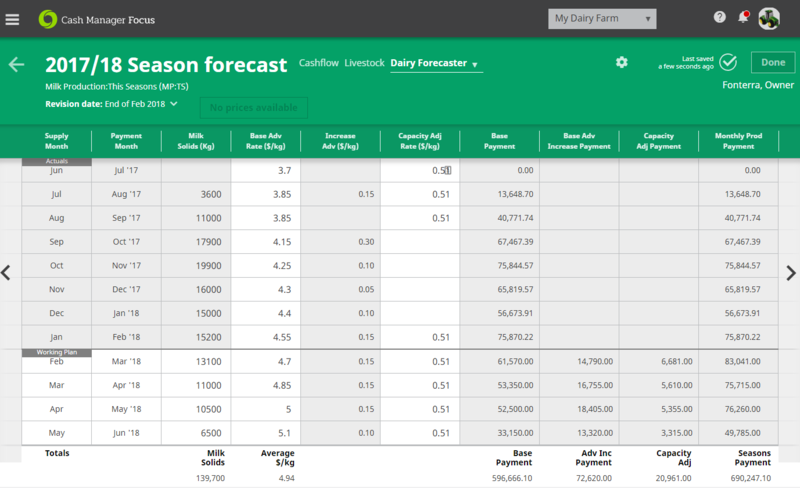 If you supply to Fonterra, Synlait or Westland, the dairy forecaster automatically updates your projected milk income as prices change, so that you can quickly see the effect any price changes have on your business. The view in the dairy forecaster aligns to your dairy company’s production year, June to May. If your financial year doesn’t match to this i.e. it runs from July to June, the dairy forecaster and the cashflow screens won’t be 100% aligned.